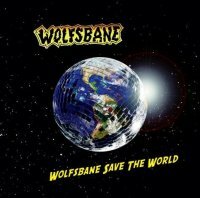 As a spotty teenager growing up in Birmingham in the late 80s Wolfsbane were our very own local heroes, they had released a number of raucous and fun albums, they had also been taken under a certain Rick Rubin’s expansive wing. We watched in awe as their ‘I Like It Hot’ music video aired on M.T.V. There was even talk of The Midlands having spawned UK’s version of Van Halen. However as history has proved, Wolfsbane were to implode dramatically whilst on the crest of a wave, vocalist Blaze Bayley was lured by a certain heavy metal band called Iron Maiden. The rough diamond we knew well, was now going to be stepping into Bruce Dickinsons intimidating boots, we know the rest. Fast forward a few years, Wolfsbane reformed for a few gigs to test the live waters again. Such was the chemistry the band decided to re-enter the studio and see if the ramshackle formula that served them so well was still alive. The album title is testament to a band who’s air for mischief is indeed still at the forefront of events. It is a statement of intent from a band with nothing left to prove. Can they ‘save the world’?, well if they did this album would be the perfect theme tune, whilst the drama unfolded you would be blissfully unaware and laughing all the way to safety. ‘Blue Sky’ the opening track, with it’s yobbish attitude, and raw round the edges vocals instantly re-unite you with an old friend. This familiarity continues with the balls to the wall grit of ‘Teacher’, where the guitars of Jase Edwards border on clumsy, but somehow they keep it together. But hey, this is too much fun to be critical. The splatter punk of ‘Buy My Pain’ tips a nod to The Wildhearts, with its snarl and pop sensibilities. Blaze Bayley has endured something of a nightmare of recent times, and he lets his guard down with ‘Starlight’, a tender song that lays itself bare; “All of the days I wasted - the hours that slipped away - I couldn’t see the future - I was already living in” The sound of a band who have matured. But, as if not wishing to dwell too long, ‘Smoke And Red Light’ sees them harking back to the early days, all verbatim and attitude; “we got 6 watt amps and an attitude that says f**k you, I know what I wanna do.”. Road weary memories of a young band against the world. The pace eases up with the ‘Illusion Of Love’ where Bayley is joined by the impressive pipes of Givvi Flynn. It is a moment of class that doesn’t sit uncomfortably. Nor does the electro tinged ‘Who Are You Now?’ not unlike 90’s band Jesus Jones. The album ends in more familiar territory with ‘Did It For The Money’ a song of such simplicity it could well have been a left over from their early days, and as such is perfect, it leaves your stereo smoking, and your pint glass empty. .”Whos round is it next…?”.